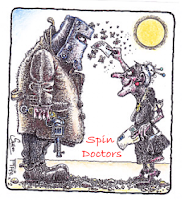 Werner's Cairns blog: Political Spin. The following is a story about the great-great uncle of Senator Harry Reid. A rose by any other name still smells as sweet. So Judy recently e-mailed Congressman Harry Reid for information about their great-great uncle, Harry Reid. NOW That’s how it's done, Folks! That's real POLITICAL SPIN! Werner, if you don’t already know, the Labor Party is the grand master of political spin and deception, they perfected it and managed to fool the people of Queensland at the March election to re-elect this pathetic and lying mob.